Historical maturity of terms temperatura and thermoscope is sketched. Problem of temperature definition and observation (measurement) is studied in detail. Temperature is a typical averaged quantity clear-cut under equilibrium only. A self-measurability condition is implied, and some consequences are outlined. 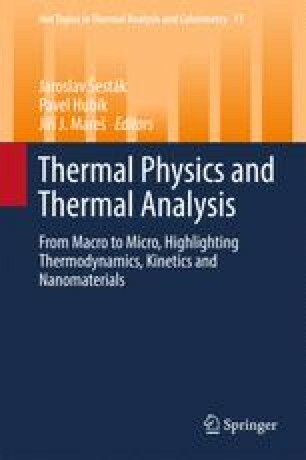 Physical and operational meaning of temperature and its self-measurability during unsteady thermal processes is analysed. Particular case of thermal analysis often idealized under constant temperature changes is thermodynamically examined. For extreme temperature changes as that during quenching, a novel term “tempericity” is proposed. Branched view to the spheres of alternative thermodynamics is shown locating thermal analysis as thermotics and quenching as thermokinetics. Non-equilibrium thermodynamics under a non-constant rate of temperature changes is analysed. Practical aspects of non-equilibrium temperatures due to heat inertia and thermal gradients are specified including cases of modulated experiments. Textbook thermodynamic description under the perceptible impact of second temperature derivatives becomes ambiguous and associated tabular values are unclear. Thermotics, thermokinetics, and the validity of the first and second thermodynamic laws are discussed bringing another dimension of the thermodynamic legacy. The concept of equivalence of work and heat is questioned. The chapter contains 126 references. The work was developed at the Join Research Laboratory of the Institute of Physics CAS, v.v.i., and the New Technologies Centre (NTC) of the University of West Bohemia in Pilsen and supported by the CENTEM project, reg. no. CZ.1.05/2.1.00/03.0088 that is cofunded from the ERDF as a part of the MEYS—Ministry of Education, Youth and Sports OP RDI Program, and, in the follow-up sustainability stage, supported through the CENTEM PLUS LO 1402.